The wealthiest man in the world has just experienced a devastating financial catastrophe that’s sure to send ripples throughout the corporate world for years to come. Amazon founder Jeff Bezos has just blown his entire fortune trying to win a giant stuffed Taz at Six Flags. Absolutely shocking. This is a tremendous stroke of misfortune for a man who was so recently on top of the world. Bezos’ descent into financial ruin began shortly after entering the amusement park and coming across a $5 carnival game displaying a giant Tasmanian Devil plush toy as a prize for knocking over a pyramid of milk bottles with a small wooden ball. Park attendees reported seeing a wide-eyed Bezos announce, “I must have him,” before handing $200,000 to the teenager running the booth in exchange for thousands of attempts to win the large stuffed cartoon character. After missing the bottles completely on every single throw, Bezos immediately handed the teenager a check for $7 billion for more chances to knock down the milk bottles and win the giant stuffed Looney Tunes character. Unfortunately, Bezos continued to lose the game and continued to spend huge sums of money for the opportunity to keep playing. 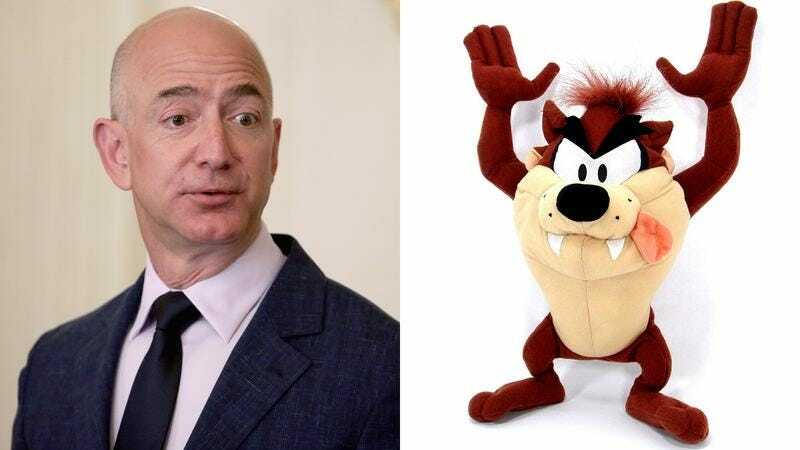 Amazon executives have reported that throughout the rest of the day, a frenzied Bezos proceeded to squander his entire $100 billion fortune by purchasing millions and millions of turns at the game in an attempt to win the stuffed Taz and losing every single time. Utterly devastating. It’ll be interesting to see if Bezos will be able to recover from this financial catastrophe and get his life back on track again. In the meantime, other billionaires better take note, because Jeff Bezos’ sudden downfall is a profound lesson that even the most wealthy and powerful among us are still vulnerable to financial misfortune.